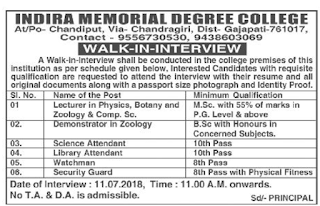 Sakti Sai Degree College, Odisha has advertised in the Sambad newspaper for recruitment of Teaching Faculty- Lecturer jobs vacancies. Interested and eligible job aspirants are requested to apply with in 15 days.Check out further more details below. Name of the College :Sakti Sai Degree College, Odisha. For the post of Lecturer- M.Sc with 55% of marks in PG level & M.Phil/Ph.D will be preferred. As per norms of college policy and negotiable for deserving candidates. 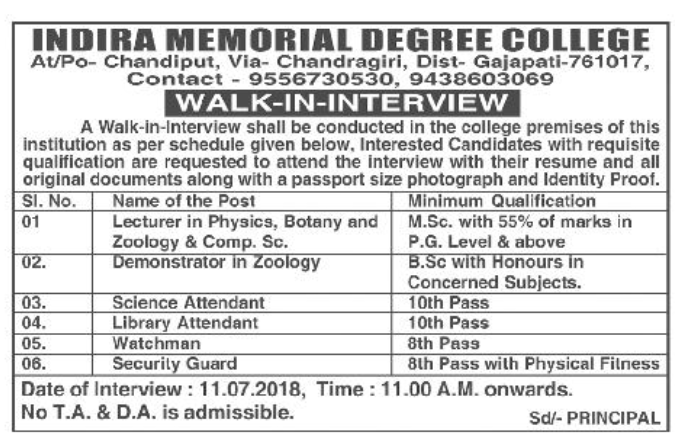 Reference: Recruitment Notification / Career Job Opportunities notice for Teaching Faculty -Lecturer on Sambad newspaper Dated 6th July 2018.